Through a collection of bold hues, gorgeous flowers, and fresh scents, this bouquet blossoms with beauty in any room that its placed. 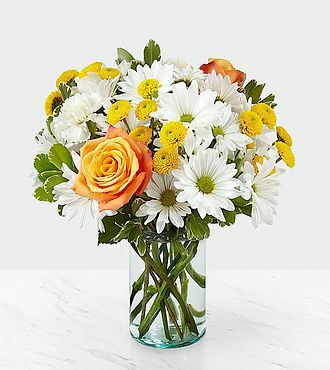 An array of orange roses, variegated pittosporum, and white daisy pompons come together in a recycled cylindrical glass vase to make the perfect gift for a loved one near or far. PREMIUM bouquet is approx. 15H x 15W.